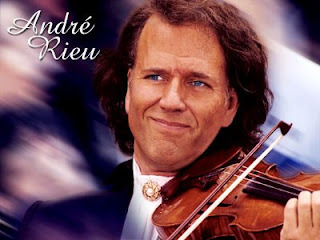 André Léon Marie Nicolas Rieu (born October 1, 1949) is a Dutch violinist, conductor, and composer best known for creating the waltz-playing "Johann Strauss Orchestra". André Rieu was born into a Christian musical family (of French Huguenot origin) in Maastricht in the Netherlands. He began studying violin at the age of five. His father was conductor of the Maastricht Symphony Orchestra. From a very young age he developed a fascination with orchestra. He studied violin at the Conservatoire Royal in Liège and in the Conservatorium Maastricht, (1968–1973). His teachers included Jo Juda and Herman Krebbers. From 1974 to 1977, he attended the Music Academy in Brussels, studying with André Gertler, winning the Premier Prix at the academy. He records both DVD and CD repertoire at his own recording studios in Maastricht in a wide range of classical music as well as popular and folk music plus music from well-known sound tracks and musical theatre. His lively orchestral presentations, in tandem with incessant marketing, have attracted worldwide audiences to this subgenre of classical music.